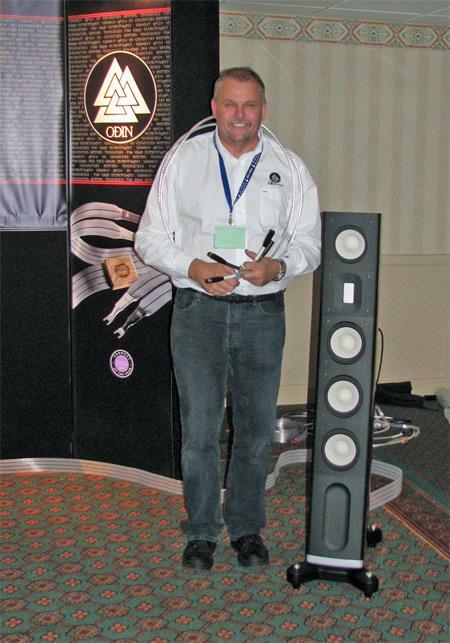 I was delighted to end the final day of RMAF 2007 in the Soundsmith room. I’ve spent quite a while in Peter Ledermann's rooms at previous shows, and loved every minute. This year was no exception. Nordost has entered the realm of stratospherically-priced cabling with the introduction of Odin interconnects and speaker cable. 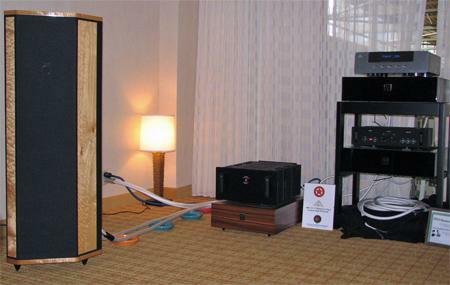 With Odin interconnects draped around Lars of Nordost's neck, and the speaker cable seen running between Raidho Ayra C3 speakers and Burmester 001 CD, BAT preamp, and Gamut D-200 amplifier (a last-minute replacement for an ailing Burmester amp), the combination of Odin interconnects and speaker cable and Nordost Valhalla power cables—Odin power cables are yet to come —delivered one of the most breathtakingly realistic depictions of a huge, three-dimensional soundstage I've ever experienced. It's you-are-there transparency was pretty damn amazing. I greatly look forward to reacquainting myself with this cabling at CES 2008, and promise to report on it in my show blog if five other Stereophile colleagues don't get to the Nordost room before me. But oh, the price, which is in the "don't ask" category, adds JA. After hosting three hour-long seminars on Sunday (following five on Friday and Saturday), I spent the final hours of the 2007 RMAF racing around rooms I really wanted to hear before the Show closed at 4pm. At 4:30pm, I stopped by what would be my last room, the one featuring a new name to me, Salagar Speakers. This Illinois company is aiming high: its first product is a beautifully finished, physically large two-way active design, the Symphony S210, that combines a 1" soft-dome tweeter with a 10" woofer in an unusual curved enclosure. Power is provided by internal ICEpower class-D modules, and the integral X-ACT crossover operates in the digital domain and includes the facility to adjust the speaker's balance to cope with room acoustics problems. The Symphony S-210 costs $7,999/pair complete with crossover, and showed promise, even in the less-than-optimal hotel room. 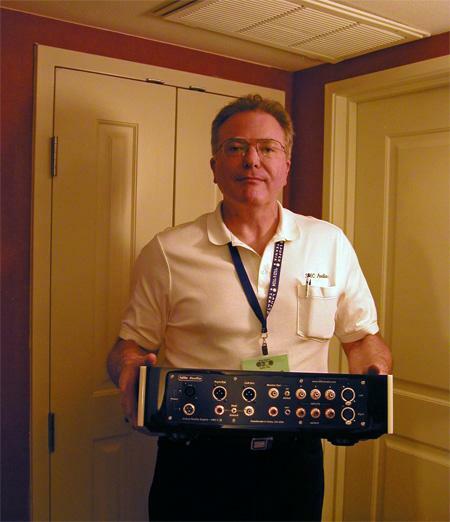 After several years of collaboration with Lew Johnson and Bill Conrad with McCormack Audio, Steve McCormack went it alone a year or so back with SMc Audio. He was demming SMc's first product at RMAF, the $6800 VRE-1 line preamplifier ("VRE" stands for "Virtual Reality Engine"). The solid-state design uses Lundahl and Jensen coupling transformers and uses J-FETs in a zero-feedback circuit. 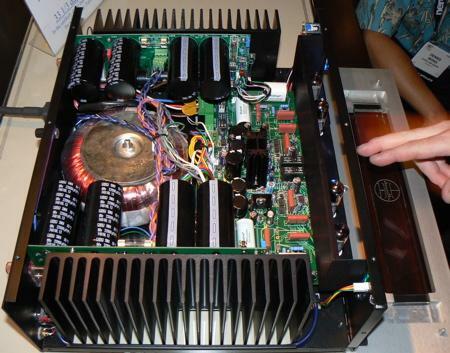 Unusually, it dispenses with the otherwise ubiquitous solid-state voltage regulators in its power supply. Instead, it uses a choke-smoothed voltage rails, which Steve feels eliminates any trace of "transistor" sound. 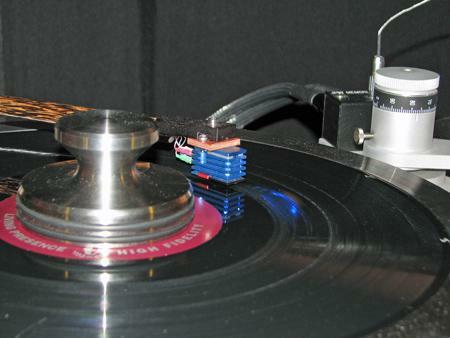 Next to come will be a matching phono stage. The penultimate room I went into on the RMAF's final day was being shared by SMc Audio and Audience. I was assuming the latter company was demonstrating its well-reviewed AC conditioner and cables, which indeed it was. But I was not expecting to see and hear loudspeakers from the Californian company. The ClairAudient LSA 16 (LSA for "Line Source Array) was designed by the late Richard Smith, cofounder of Audience, and features 4, 8, 16, 24, or 32 50mm drive-units, used full-range, with no tweeters or crossover (something I have not seen since the Ted Jordan designs of the late 1970s). A separate subwoofer handles the low bass and with a very high claimed sensitivity, the ClairAudient design will produce very high spls in-room, but with great clarity. The sound of the 16-driver version in the RMAF room was a little lacking in top-octave air, but was otherwise very detailed. The rest of the system comprised a McCormack Audio UDP-1 universal player, McCormack monoblock power amps, and a preproduction example of Steve McCormack's new SMc VRE-1 line preamp. Of the many speakers I have reviewed over the years, the one I now regret the most having had to return to the manufacturer was the mbl 111B. 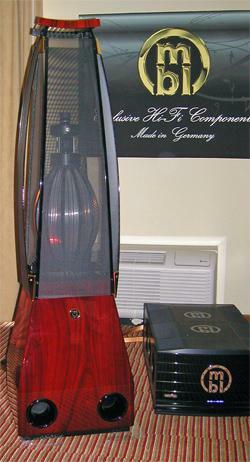 No other tweeter has so efforlessly floated high-frequency sounds into my listening room like the German manufacturer's unique, omnidirectional "Radialstrahler" design. 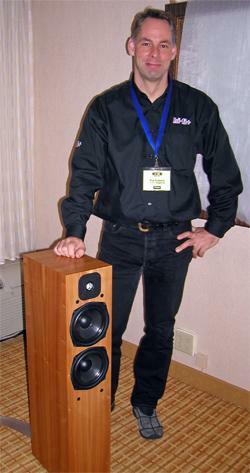 At RMAF, mbl was demming the larger 101E speaker, which Michael Fremer reviewed in October 2004. The sounds of Brian Bromberg's solo double bass on "Come Together" and Nils Lofgren's Ovation guitar on his Live Acoustic CD, played on mbl's new digital gear, were to die for. 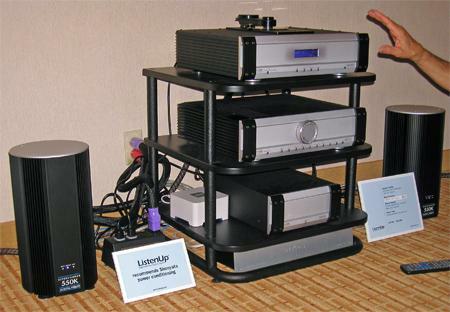 I experienced a fascinating comparison in one of the RMAF rooms featuring systems from Colorado dealer ListenUp. With Sonus Faber Cremona Elipsa speakers (review forthcoming) driven by a combination of Musical Fidelity X-T100 integrated amplifier "supercharged" with MF's 550K monoblocks, and Shunyata AC conditioning and power cables, CDs played back on MF's new top-loading CD player were being compared with lossless-encoded files of the same recordings played back over WiFi via a Sonos ZP80 that fed its S/PDIF digital output to the MF player's DAC section. The data were the same, so other than the WiFi connection, there was no reason for the sound to be different. And I did indeed find it very difficult to hear any consistent difference between the two presentations. Perhaps the low frequencies were a little better-defined and extended via CD, but I don't think I could have identified that without knowing which was which. Interesting. The NSR Sonic Research D3 Concerto Sonata loudspeaker ($4495/pair) was reportedly making a lot of waves at its world premiere. Displayed in not completely broken-in prototype form, with tweaking of crossover and capacitors still to come, the speaker is claimed to have 93.7dB sensitivity. The bottom of the enclosure features an exclusive "Acoustic Projection Lens." The lens, developed over the course of 30 years by its guitarist/luthier/locomotive engineer designer, is claimed to act as a sonic prism that overcomes randomly generated frequencies. 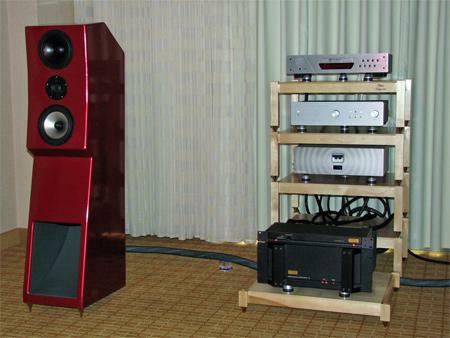 The company also offers the much larger D1 Concerto Reference ($32,000/pair). Both speakers have back panels that intentionally resonate like an instrument, a feature that JA points out was first seen in the controversial Bösendorfer loudspeakers. After my final hi-rez seminar on Sunday, and triggered by my very positive experience with the inexpensive Avalon NP2 speakers, I went across the hallway to the room Denver dealer HD Home Cinema & AV Design was using to debut Avalon Acoustics' new $9300/pair Ascendant loudspeaker. This combines the composite-dome tweeter from the NP2 with a pair of Kevlar-composite woofers in the angled, faceted enclosure that has become a de facto trademark of the Colorado company's high-end speakers. With Ayre MX-R monoblocks, Ayre C-5xe universal player, K-5xe preamp, and P-5xe power-line conditioner, and wired with Cardas cable, the Avalon system proved one of the best-sounding of the Show. 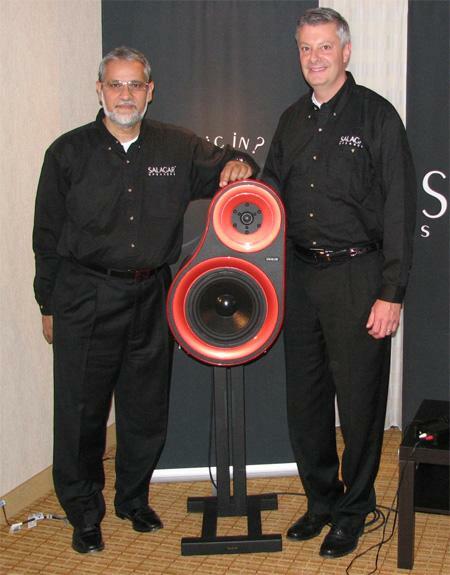 When I entered the room assembled by Matrix Systems of Pennsylvania, Joe of Critical Mass (maker of excellent, hand-crafted supports for amplifiers and other components) was playing a recording of jazz vocalist Mary Stallings (Maxx Jazz). I was immediately captivated, both by the sound, and by Stallings' artistry. When Joe recognized me and asked me if I wanted to play some of my own music, "No way!" I exclaimed. "Let the music continue." I have commented in previous blogs on the easy, unforced and natural sound of Moscode hybrid electronics. 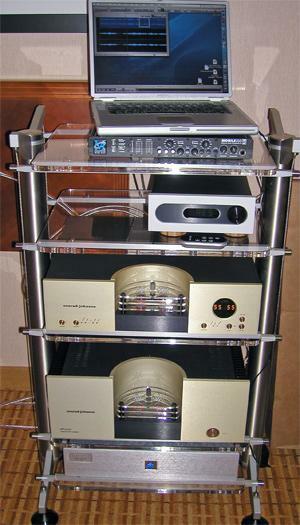 Here, the Moscode 402 200Wpc hybrid amplifier was paired with Quad 988 electrostatic speakers that were bolted to custom bases, Esoteric DV-50 universal player, and Cardas Golden Reference cables. Since neither George Kaye nor Gage Rommel was in the room at the time, I was unable to determine what tubes were being used in the amp. But the ability to easily roll tubes in this unit makes it a dream for people like myself who love to tailor the system's sound to their specific preferences. As well as the excellent-sounding Avalon NP2 speakers, the system I used to play back 24-bit AIF files from my laptop consisted of (from top to bottom): Metric Halo ULN-2 to convert the Firewire output of my Apple PowerBook to AES/EBU; Bel Canto DAC 3 (which I enthusiastically review in the forthcoming November issue), sitting on cylindrical wooden footers from a new company Waipuna Sound and connected to the Metric Halo box via a DH Labs AES/EBU link; Conrad-Johnson CT5 preamp and ET250S hybrid power amplifier; and Nordost Thor AC conditioner. Nordost Valhalla interconnects and speaker cables were used throughout. Equipment rack was the attractive and effective Stillpoints, which suspends the acrylic shelves from four steel cables. Roy Gregory, that is, editor of HiFi+ magazine from the UK, who had chosen and set-up the system I was using for my high-resolution demonstrations. And my thanks also to Roy's wife Louise, who was signing up attendees for my dems at the Show's front desk. Perhaps you've experienced something similar. 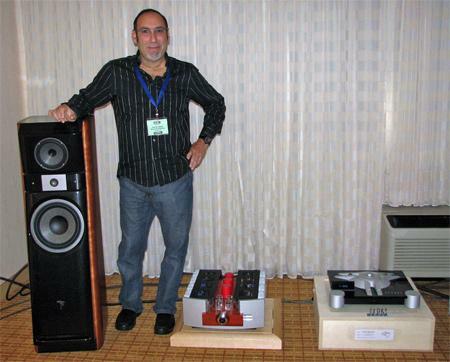 I recently invited members of the Bay Area Audiophile Society to hear my system. Many of them had visited our house before, but only to attend demos of other equipment that had been brought in specifically for the event. Now I finally had the chance to let BAAS members hear my system whole and complete. Garth Leerer sure knows how to make a vocal lover happy. As soon as he spotted me entering the Musical Surroundings room, the Oakland-based distributor chose to demonstrate the supreme musicality of the Musical Surroundings’ "Audio Unlimited" system by playing an LP of mezzo-soprano Janet Baker. Recorded in her prime, and sensitively accompanied on piano by the great Gerald Moore, Baker began singing a grief-stricken Schubert song. To say I was blown away by the intensity of her expression, the beauty of her voice, her daring to sing with such naked emotion, and the system's ability to capture and integrate all the different colors and shadings of her instrument only begins to tell the tale. I was transfixed.